A NEW EXPRESSWAY HAS OPENED IN OSAGE BEACH! IT IS NOW U.S. HWY 54! "OLD" HWY 54 THRU OSAGE BEACH IS NOW CALLED "OSAGE BEACH PARKWAY"! 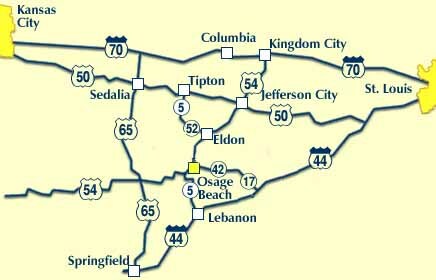 Click here for an expressway map from the Osage River Bridges thru Osage Beach. Upon crossing the Osage River bridge, you will have the option of driving on Bus 54 (that is the "old 54" that will become Osage Beach Parkway or chose the new Hwy 54 expressway. If you chose the new 54 expressway, you will need to exit at Passover Rd. Turn right onto Passover Rd. Go one block to the trafficlight for Osage Beach Parkway. Turn right onto Osage Beach Parkway. Go to the next trafficlight and Quail's Nest is on the right, adjacent to the Osage Beach Premium Outlets entrance. From Camdenton, take Hwy 54 east to Osage Beach. You WILL be on the new Hwy 54 expressway. You will need to exit at Passover Rd.Turn right onto Passover Rd. Go one block to the trafficlight for Osage Beach Parkway. Turn right onto Osage Beach Parkway. Go to the next trafficlight and Quail's Nest is on the right, adjacent to the Osage Beach Premium Outlets entrance.